PC Perspective had a handson experience with the new ASUS ROG Swift PG27AQ display. This 27" LED-backlit model has a 3840 x 2160 pixel (4K) resolution IPS panel that runs at 60Hz and features NVIDIA's G-Sync technology. It offers 1000:1 contrast ratio, 300 nits brightness and a "super narrow" bezel. 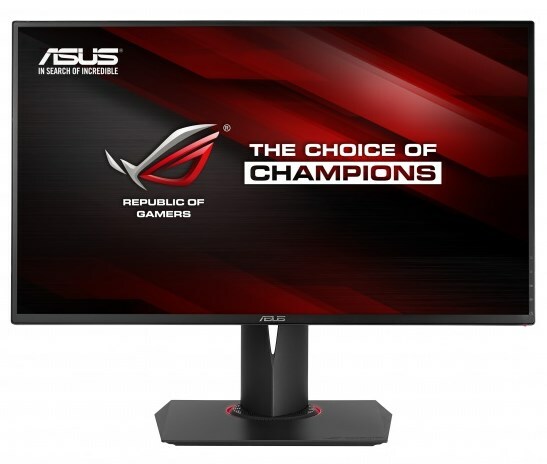 The 27-inch LED-backlit display features NVIDIA G-SYNC technology to synchronizes its refresh rates to the computer’s graphics-processing unit (GPU), eliminating screen tearing and minimizing stutter and input lag to deliver the smoothest gaming experience possible. The Swift PG27AQ also includes a five-way navigation joystick to navigate the on-screen display (why not, it’s a gaming monitor after all). The monitor stand features full tilt, swivel, pivot and height adjustment, as well as a “smart cable-management system”. Pricing and availability is unknown.